Here is yet another article about the expansion of powers of the EPA. I received this from Sue Sadler of the James City County Tea Party. 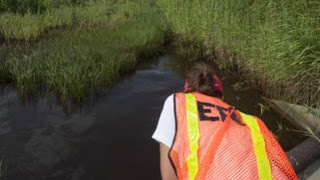 A U.S. Environmental Protection Agency (EPA) worker looks at oil from the Deepwater Horizon spill which seeped into a marsh in Waveland, Mississippi July 7, 2010. The U.S. Environmental Protection Agency wants to change how it analyzes problems and makes decisions, in a way that would give it vastly expanded power to regulate businesses, communities and ecosystems in the name of "sustainable development," the centerpiece of a global United Nations conference slated for Rio de Janeiro next June. The major focus of the EPA thinking is a weighty study the agency commissioned last year from the National Academies of Science. Published in August, the study, entitled "Sustainability and the U.S. EPA," cost nearly $700,000 and involved a team of a dozen outside experts and about half as many National Academies staff. According to the Academies, the sustainability study "both incorporates and goes beyond an approach based on assessing and managing the risks posed by pollutants that has largely shaped environmental policy since the 1980s." It is already known in EPA circles as the "Green Book," and is frequently compared by insiders to the "Red Book," a study on using risk management techniques to guide evaluation of carcinogenic chemicals that the agency touts as the basis of its overall approach to environmental issues for the past 30 years. At the time that the "Green Book" study was commissioned, in August, 2010, EPA Administrator Lisa Jackson termed it "the next phase of environmental protection," and asserted that it will be "fundamental to the future of the EPA." Jackson compared the new approach, it would articulate to "the difference between treating disease and pursuing wellness." It was, she said, "a new opportunity to show how environmentally protective and sustainable we can be," and would affect "every aspect" of EPA's work. According to the study itself, the adoption of the new "sustainability framework" will make the EPA more "anticipatory" in its approach to environmental issues, broaden its focus to include both social and economic as well as environmental "pillars," and "strengthen EPA as an organization and a leader in the nation's progress toward a sustainable future." Whatever EPA does with its suggestions, the study emphasizes, will be "discretionary." But the study urges EPA to "create a new culture among all EPA employees," and hire an array of new experts in order to bring the sustainability focus to every corner of the agency and its operations. Changes will move faster "as EPA's intentions and goals in sustainability become clear to employees," the study says. The National Academies and the EPA held a meeting last week in Washington to begin public discussion of the study. Even as it begins to go public, EPA, which has come under renewed fire for its recent rulings on new auto emissions standards and limits on coal-fueled power plant emissions, is being determinedly low-key about the study. Initially questioned about the document by Fox News weeks ago, an EPA spokesman eventually declared that "we are currently reviewing the recommendations and have not yet made any decisions on implementation." During the deliberations, he said, "the agency will seek a wide range of perspectives on the recommendations from the business community, non-governmental organizations, the scientific community, and others." The spokesman also said that EPA had "no current plans" for the so-called "Rio + 20" environmental summit next summer "that pertains to the Green Book's recommendations." The U.N. summit meeting, however, is mentioned in the Green Book itself as an instance where "sustainability is gaining increasing recognition as a useful framework for addressing otherwise intractable problems. The framework can be applied at any scale of governance, in nearly any situation, and anywhere in the world." When it comes to applying the framework via EPA, the study says it is likely to happen only "over time." The Red Book risk assessment approach now in use, it notes, "was not immediately adopted within EPA or elsewhere. It required several years for its general acceptance at EPA and its diffusion to state and local agencies." What is "sustainability" in the first place? That is a question the study ducks, noting that it is only advising EPA on how to bring it within the agency's canon. The experts take their definition from an Obama Administration executive order of October, 2009, entitled Federal Leadership in Environmental, Energy and Economic Performance. It defines sustainability in sweeping fashion as the ability "to create and maintain conditions, under which humans and nature can exist in productive harmony, that permit fulfilling the social, economic, and other requirements of present and future generations." The study specifically notes that "although addressing economic issues is not a core part of EPA's mission, it is explicitly part of the definition of sustainability." In an American context, the study says sustainable development "raises questions that are not fully or directly addressed in U.S. law or policy." Among them: "how to define and control unsustainable patterns of production and consumption and how to encourage the development of sustainable communities, biodiversity protection, clean energy, environmentally sustainable economic development, and climate change controls." The study notes that sustainable development is "broader than the sum of U.S. environmental and conservation laws." It adds that "a great deal more needs to be done to achieve sustainability in the United States." The experts say they found the legal authority for EPA to foster sustainable development without further congressional approval in the wording of the National Environmental Policy Act of 1969, or NEPA. The study says the law, the cornerstone of U.S. environmental policy, declared that the "continuing policy of the Federal Government" is to "create and maintain conditions, under which humans and nature can exist in productive harmony, that permit fulfilling the social, economic, and other requirements of present and future generations." What ends that tacit authority should be used for are far less clear, because the study asserts that they need to be made up and codified as EPA goes along. "EPA needs to formally develop and specify its vision for sustainability," the study says. "Vision, in the sense discussed here, is a future state that EPA is trying to reach or is trying to help the country or the world to reach." 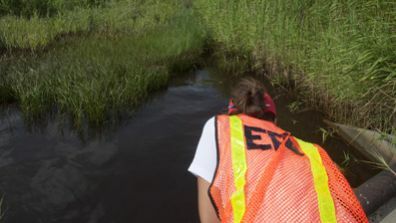 "Environmental impact assessment tends to focus primarily on the projected environmental effects of a particular action and alternatives to that action," the study says. Sustainability impact assessment examines "the probable effects of a particular project or proposal on the social, environmental, and economic pillars of sustainability"—a greatly expanded approach. One outcome: "The culture change being proposed here will require EPA to conduct an expanding number of assessments." As a result, "The agency can become more anticipatory, making greater use of new science and of forecasting." The catch, the study recognizes, is that under the new approach the EPA becomes more involved than ever in predicting the future. "Forecasting is unavoidable when dealing with sustainability, but our ability to do forecasting is limited," the document says. One forecast it is safe to make: the study shows whatever else the new sustainability mission does for EPA, it aims to be a much, much more important—and powerful-- federal agency than it is, even now.